I was amazed by an album my best friend sent to me. 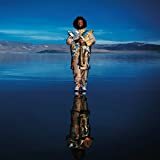 The album is “HEAVEN AND EARTH” by KAMASI WASHINGTON. The strip of paper around the cd jacket says “A symbol of new generation jazz”. The first tune “FISTS OF FURY” somehow made me nostalgic as soon as I played it. I was sure I knew it. As you can guess from the title, it is the theme song of Bruce Lee’s kung fu movie “Fist of Fury”. I was a big fun of Bruce Lee and the album I bought for the first time in my life was a sound track album “The Way of the Dragon”, so I was immediately absorbed in the album just by this first tune. I knew nothing about new generation jazz so I checked it out on the internet to know that it is a modern jazz as the result of the fusion of some kind of music like hip hop, R&B and so on. KAMASI WASHINGTON who is a saxophone player is the center of attention in this genre now. I found there are already many artists who belong to this genre in many country, so I realized there had already been the tide of the music world before I knew it. I felt it interesting when I saw “SOIL＆“PIMP”SESSIONS” was categorized as a Japanese artist of this genre. I’m really grateful to the friend who always gives me fresh stimulation. SOIL&"PIMP"SESSIONS - Connected feat. Nagaoka Ryosuke　YouTube Ver.